Does evolution have a mountain of evidence? - READY... SET... QUESTION! There is an overwhelming amount of evidence that supports evolution. In fact, biologists describe it as being an enormous “mountain of evidence.” It has become enormous due to how long the evidence has been collected. Darwin published his most famous work, The Origin of Species, in 1859, but evidence had already begun to add up beforehand. For hundreds of years, evidence has been discovered and compiled that overwhelmingly supports biological evolution. In the light of so much evidence, why do most people find themselves pointing their thumbs down at the idea of common ancestry? Why do only 33% of Americans give a thumbs up to the idea that humans evolved into existence via natural processes? Is it possible that 67% of the U.S. population happens to be improperly educated on biological evolution? Yes, this is part of the reason because educational institutions have failed to define the term consistently, of which I go into great detail in my book What Is Evolution? 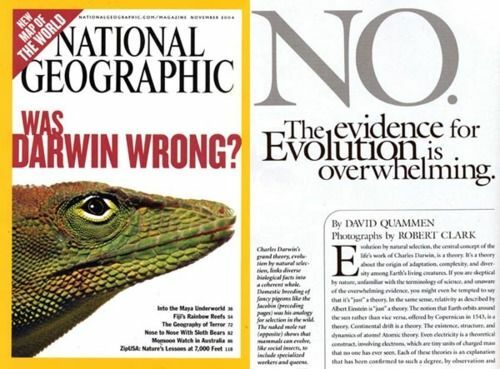 Could there be an other reason why most Americans do not accept biological evolution even though there is an enormous mountain of supportive evidence? Could the reason some folks dismiss the validity of evolution have to do with what is at the heart of Empirical Research? “Empirical research is based on observed and measured phenomena and derives knowledge from actual experience rather than from theory or belief. “How do you know if a study is empirical? Read the subheadings within the article, book, or report and look for a description of the research ‘methodology.’ Ask yourself: Could I recreate this study and test these results? -Specific research questions to be answered. -Definition of the population, behavior, or phenomena being studied. What part of evolutionary research is empirical? Is evolutionary research based on “observed and measured” phenomena? Can evolutionary researchers “recreate” or “test” study results? Evolutionary biologists have a mountain of evidence at their disposal, have they used this evidence to construct tests and experiments that produce empirical data? Why leave the phenomena being studied void of a definition? Why base research on the interpretation of evidence rather than on observation and the measuring of said phenomena? These questions are begging for an answer. I dive deep into these and many others in my book entitled: What is Evolution?